Looking to capitalize on the interest surrounding GarageBand for the iPad, Apogee Electronics has announced the upcoming release of Mike, a studio-grade microphone for recording audio on the iPad, iPhone and iPod Touch. 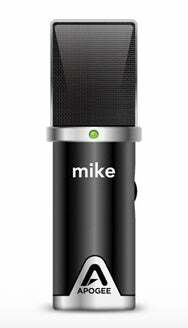 Mike is specifically designed to record vocals and acoustic musical instruments, Apogee says. It can also record voiceovers, interviews or podcast recordings with what the company bill as “pristine sound quality” thanks to PureDigital technology. At 4.5 inches tall, the Apogee is about the size of an iPhone or iPod touch. It doesn't require any configuration, and it features a multicolor LED for status indication and input level monitoring. Mike comes with its own mic clip and desktop stand. Some details left out of Friday’s announcement—when Mike will be available and how much the microphone will cost.